1851 – An act to regulate rodeos in California was adopted and was meant to manage ‘working rodeos’. This type of rodeo gathering was essentially designed to separate different owners’ cattle herds which would have grazed together over winter. 1882 – William, “Buffalo Bill” Cody creates the first Wild West show in North Platte, Nebraska. 1885 – Wild West rope trick performer, Guy Weadick was born in Rochester, NY. He would eventually create the first western show that was called “a stampede”. The term ‘rodeo’ didn’t come to mean an entertainment event until the 1920’s. The performers didn’t adopt the word ‘rodeo” to describe what they do for another two decades. 1886 – The Calgary and District Agricultural Society held their first fair. The fair would later evolve into The Calgary Exhibition and Stampede. 1897 – The first Cheyenne Frontier Days celebration was held in Cheyenne, Wyoming. It became the largest riding, roping and western show in the United States; boasting attendance figures over 200,000 per year. 1902 – The Raymond Stampede was founded as a Canada Day celebration in Raymond, Alberta. It is the oldest rodeo in the country. Both the rodeo and town are named for local rodeo promoter, Raymond Knight. 1903 – Raymond Knight builds the Raymond Stampede grounds; which includes a race track, covered grandstand and the first “shot gun” bucking chute ever built. It is the oldest continuously used rodeo facility in the world. 1904 – Bill Pickett, a black Texas cowboy, invented “bull dogging”. It is the only modern rodeo event with a single, identifiable originator. Pickett’s ‘dogging style’ included biting the upper lip of the steer he was wrestling. 1912 – Guy Weadick and H C McMullen organized the first Calgary Wild West show which Weadick called a “Stampede”. The event offered prizes four times higher than any other rodeo, drawing the top competitors from across North America. 1913 – The first female rodeo star joined the sport when Tillie Baldwin put on a bulldogging exhibition. Born Mathilda Winger in Norway, she changed her name when she joined Captain Jack Baldwin’s Wild West Show in Texas. 1919 – The Bascom bucking chute, a side-delivery, reverse opening chute, that was safer than the “shotgun type”, was invented. 1919 – Guy Weadick organized a Victory Stampede to honour soldiers returning to Canada from World War I. 1922 – American promoter, Tex Austin, created the Madison Square Garden Rodeo, eclipsing the Cheyenne Frontier Days as the country’s pre-eminent riding and roping exhibition. 1923 – Guy Weadick created rodeo history when he merged his Victory Stampede festival with the Calgary Industrial Exhibition into a single annual event known as the Calgary Exhibition and Stampede. It quickly became, “The Greatest Outdoor Show on Earth”. 1924 – The Raymond Stampede adopted the Bascom chute system. 1924 – Tex Austin produced a Wild West show in England called The London Rodeo at Wembley Stadium. 1929 – Cowgirl extraordinaire, Bonnie McCaroll became the first professional female rodeo star to die from the sport after a bronc riding accident in Pendleton, Orgeon. Many rodeos dropped women contestants after the incident. 1929 – The Rodeo Association of America is formed to codify the sport and create a points system to decide the “world’s champion”. 1931 – Promoters of the Stamford Cowboy Reunion event created special safer events for females which included an event that would become modern barrel racing. 1936 – Cowboy contestants went on strike during a Boston Garden rodeo run by long-time rodeo promoter, Colonel William T. Johnson. As a result, Johnson was forced to give the contestants a greater share in the gate receipts. The contestants then created a trade association known as the Cowboys Turtle Association which later became the modern Professional Rodeo Cowboys Association. 1940 – Gene Autry, the famous movie star and western singer, took over most of the established rodeos in the US. His involvement helped the rodeo survive the financial hardships of WWII. 1945 – The Cowboys Turtle Association became the Cowboy Rodeo Association. It marked the first time the performers used the term ‘rodeo’ to describe themselves. 1948 – The WPRA, Women’s Professional Rodeo Association, was established to bring gender equality to the sport and to lobby for equal prize money with male competitors. 1963 – The Canadian Cowboys’ Association was created. It covers just three provinces; Alberta, Manitoba and Saskatchewan. 1968 – Bowing to pressure from the WPRA, barrel racing was permanently added to the National Finals Rodeo event listings. 1969 – The Leduc Black Gold Rodeo was started by Harvey Northcott, a local stock contractor. 1974 – The first Canadian Finals Rodeo was created by Bob Robinson, then president of the Canadian Professional Rodeo Association. Prize money per event was $29,478 at the time. The same purse is now worth $1.5 million. The CFR has been held in Edmonton every year of its existence. 2005 – The Saskatchewan-based Canadian Cowboys’ Association brought the province of Ontario into their fold which made them the largest rodeo group geographically in the country. 2006 – Non-Canadians were allowed to compete in the Canadian Finals Rodeo for the first time. 2008 – The Canadian Finals Rodeo and the US-based National Finals Rodeo aligned their events so points and money earned in either country counted toward the performers’ year’s total. 2012 – Leduc’s Black Gold Rodeo founder Harvey Northcott was inducted into the Canadian Pro Rodeo Hall of Fame in Calgary. 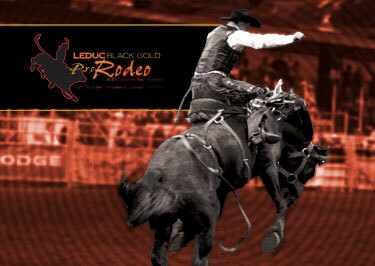 2014 – The Black Gold Rodeo celebrates its 45th year in the city of Leduc.